It’s difficult to ignore the ‘go green’ mantra that’s sweeping through the media and permeating virtually every industry. The way I see it, most of the activity is focused on marketing and printing consumer-friendly green stickers that proclaim enhanced efficiency of sorts for the same old products. Even so, it is time for us to take responsibility for our carbon footprint by using what we have more intelligently, by buying more efficient products in the first place, and — for electronics enthusiasts — by designing with efficiency in mind. Changing behavior requires data — what better excuse for me to buy one of those energy monitors I’ve been eyeing for months (see photo). Prior to this purchase, I used a short extension chord with the outer insulating jacket removed and a clamp-on current meter around the hot lead to determine current flow. However, the new energy use meters are much easer. Not only do they perform the power factor corrections, they can even calculate operating cost in dollars and cents. I’ve been a long-time user of CF lighting, but never achieved the activation energy required to test all the electrical devices in my home or workshop. 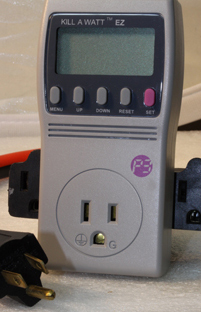 With my new meter, moving from appliance to appliance and from device to device was an education in energy use. Some of the older equipment in my shop has a better energy profile than the new equipment — especially older 120 VAC test equipment with an on-off switch. The low voltage wall transformers that power my new instruments consume energy just sitting there. One of the biggest hits to my wallet turned out to be a large, rack mounted UPS. Before testing the power consumption at idle, I never considered the operating cost. However, at 200W, 24x7, the UPS turns out to be one of the most expensive pieces of equipment in my workshop. Another surprise was my desktop computer. Turning on my screen saver adds an additional 40W load to my PC’s power supply. Leaving the self-powered speakers on while the computer is off — a 20W hit. Laser printer on standby — another 20W. A power strip full of wall transformers idling away — 25W. Copy machine on standby — 20W. As you can see, energy use adds up quickly. However, unless you’re energy conscious when you purchase that new video card or rack-mounted power supply, you might be leaving out an important variable in your purchase decision: operating cost. Wouldn’t it be great for manufacturers to list, for example, relative energy consumption for hard drives? Just how much extra does it cost to run one of those 9,600 RPM drives versus a 10,000 RPM model? Another area highlighted by my time with the energy use meter is how little forethought I’ve given to the operating cost of the various devices that I’ve designed and built. For example, in deciding between an inefficient single-chip linear supply and a more efficient switched supply, my thoughts have been on heat production, space requirements, noise generation, ancillary component needs, and — of course — initial cost. I’ve never considered long-term energy consumption to determine which power supply design makes the most economic sense. If your project includes a fan, do you plan to run it constantly or only when needed? Does the design for your new device have an auto shutdown feature so that it shuts down after a preset time has passed without activity? Do you really need a string of super jumbo LEDs on the front panel of your new project, or will a small, energy-efficient LED do the job? If your circuit includes a communications transmitter, is the power output the minimum needed for reliable communications? If your design includes mechanical linkages and motors (think robot), and it’s intended for constant use, are the materials as light as possible? Are the motors high efficiency or simply the least expensive to purchase?